How to Play Scrabble Like a Champion is the latest addition to my word games library. It is an indispensable treatise on Scrabble that delves into the deep nooks and crannies of the game, revealing the concrete strategies expert players have developed to master it. As always, when I come across a resource that I think will leave a major footprint in the word games landscape, I like to interrogate ... er ... interview ... its creator. And I'm pretty sure you'll agree by the end of this interview, that few people would be more qualified to undertake such a penetrating analysis of our favorite board game than this book's author, Joel Wapnick. Tell us about the guy in the photo. I live in Montreal, work at the Schulich School of Music, McGill University. 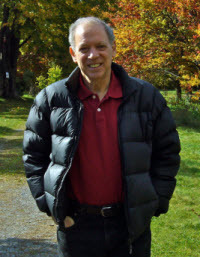 I’m originally from the United States, came to Canada in 1978. I enjoy playing the piano and writing fiction. I understand that you hope "one day to be better known as a novelist than as a Scrabble player". Can you tell us a bit about your novel-writing? I’ve completed a second draft of my first novel. I won’t say anything about it other than its title is The View North From Liberal Cemetery, and it is currently 93,032 words long. When did you first realize that Scrabble was going to become more than a kitchen-table diversion for you? 1975, when I played in my first tournament. Who and/or what were the greatest influences on your rise to the upper Scrabble echelons in the early days? There were many. If you look at the acknowledgements section in my book, most of the players who contributed to Al and Donna Weissman’s newsletter were important influences. What's your proudest achievement in Scrabble to date? 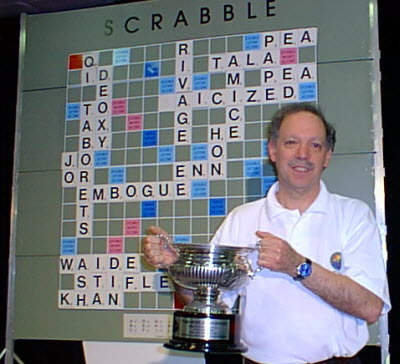 Winning the World Scrabble Championship in 1999, no doubt about it — especially against Mark Nyman in the final, who is such a great player, and who beat me in the 1993 final. Can you tell us how the original How to Play Scrabble Like a Champion book came into being? What was the main motivation for the updated version? The original was called The Champion’s Strategy for Winning at Scrabble Brand Crossword Game, published by Stein & Day in 1986. Terrible title. Anyway, Stein & Day went bankrupt a few weeks after my book was released, and that was that. Is the market showing increased interest in Scrabble strategy resources like yours, or is it still limited to the tiny group of us obsessive types? I think that it has great potential. Joe Edley’s book, Everything Scrabble , does very well on Amazon, as does Mike Baron’s SCRABBLE Wordbook . Does a book about Scrabble need to be officially sanctioned by Hasbro or Mattel? If not, how is the reader to choose between all the Scrabble books out there nowadays? Do you have a personal shortlist? Legally, I don’t think so. Practically, absolutely. However, it isn’t a matter of quality control. Rather, the companies want a cut of the profits and to make sure that their trademarks aren’t compromised. Brian Sheppard’s dissertation heads the list. Also excellent are Wordgame (a series of newsletters by Marc Watson), and Brian’s newsletter Rack Your Brain. All of this stuff is out of print. As for my own books, Can-Am 2002 is pretty good if you want to learn about strategy. As is my current book. I’m also partial to Stefan Fatsis’s Word Freak , though not as an instructional guide. Obviously a top level Scrabble player has to be competent in both word knowledge and strategic skills, but can you clarify the relationship between these two aspects of Scrabble mastery? Is it possible to say that one is more important than the other? They are both important, with word knowledge defining the upper limit of what one can achieve strategically. Word knowledge is to strategy as musical technique is to expressive playing. As you stress in How to Play Scrabble, strategy is far more sophisticated than most people realize — most casual players just think about squeezing the biggest score possible out of their rack. Can you give an example of a powerful strategic consideration that most lounge room players would never think of? Keeping track of the consonant/vowel ratio among the unseen tiles, in the middle of a game. Is there such a thing as 'playing style' in Scrabble? Would you say that at the top level of the game you can identify elements of 'style' that distinguish yourself from other experts? Can you give a specific example of a game situation in which a player's personal style would play a big role? A big role? No. Most players’ “playing styles” differ only in their propensities for blundering. Now there's a quote I'm going to steal! 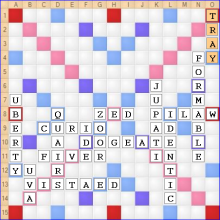 What is one important way in which Scrabble strategy has changed thanks to the advent of sophisticated computer analysis tools in the last 10-20 years? John O’Laughlin’s work on leave evaluations has been tremendously important. Much of the knowledge had been pretty well intuited earlier, but to be able to make accurate assessments of the value of a leave, based on some general rules (as I show in what I think is the most valuable part of my book), has been very helpful. 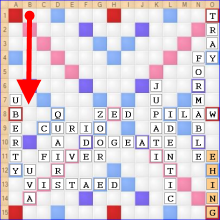 If the best human Scrabble player in the world was to play 1,000 games against the best computer Scrabble player in the world, what do you think the outcome would be? Is there an aspect of the game that humans do much better than computers? If so, will computers eventually catch up? The human would come out somewhat ahead. Computers could improve in terms of making educated guesses concerning opponents’ rack, taking advantage of weak players, and, most importantly, taking the game score into account. Are there any big mistakes you've made in important games that you still have nightmares about? I do rue missing QUICHE against Bob Watson in 1988, and RESOJETS against Brian Cappelletto in the 2001 WSC. Sure wish I had played HELMING against Mark Nyman, which would have won me the 1993 WSC, and that I hadn’t played so poorly against Joe Edley in 1992 on the last day of the NSC. If I had been better than I was, I’d have three WSCs and three NSCs. But I wasn't. And now for a Word Buff Flashback. If you want to skip it to get back to the main thread of the interview, just click here. The year is 1993, and we are in New York for the 2nd World Scrabble Championship (WSC). After 20 grueling preliminary games, Joel Wapnick (Canada) faces Mark Nyman (UK), in a best of five finals. Joel is in a great position. He has won the first two games and now needs to win just one of the remaining three. Even when Mark wins the third game, the odds are still well and truly in his favor. In the latter stages of game four, his odds are even better. On his 7th play, Joel bingos with FORMABLE to surge ahead by a massive 174 points. Although Mark recovers some lost ground with a high-scoring response of TRAY, Joel still holds a commanding 129 point lead going into his 8th move. And with just a few moves remaining, we can only imagine what he feels as he finds himself staring at another bingo. I thought that EHING would win easily, so why take a chance that Mark could come back with something like a triple-triple THORAXES? So he opts for EHING, down the lower right, for 41 points, forgoing the 81 point bingo. The 40 point sacrifice will make this game one of the most memorable in the history of the WSC. Miraculously, Mark goes on to score over 200 points in the next three moves, without the help of that dreaded triple-triple! At the end of this sequence he has closed the gap to 460-443, to trail by just 17 points, and holds only two letters on his rack: H and K. A straightforward outplay of KHI, for 20 points, leads to a seemingly impossible victory by 9 points! That game drew Joel and Mark at two wins each, requiring a winner-take-all fifth game to be played. The final game was won by Mark, who was promptly crowned 1993 World Scrabble Champion, in a 'jaws of defeat' Scrabble victory to beat them all. Had I played HELMING, Mark probably would have tried PHOTOSEX*, I would have challenged it off, and that would be that! Now if this little story has made you feel a bit sad for Joel, don't worry. He gets a shot at revenge. Although he has to wait six more years for it. Can you give us your thoughts on this complicated state of affairs — particularly in view of the recently revived calls for a unified Scrabble lexicon? I would greatly prefer a unified word source, and in fact have alleviated the problem for myself by not competing in any TWL tournaments, from now on, save national championships. North America has gone from a position of Scrabble dominance to a backwater in a few years, and one of the reasons has to be our refusal to take up CSW. There are so many Scrabble words to learn — around a quarter of a million words in the international word reference, for example! Does a person need to have photographic memory to master the Scrabble dictionary? If not, where would a beginner even start? I assume that you are asking whether a person needs a photographic memory to master all of the words, which is more than what is needed to play very good Scrabble, but which is an ideal that players such as myself aspire to. The answer is no. However, it is helpful to use learning techniques that minimize the forgetting factor. Unfortunately, it is possible to solve all possible anagrams up to and including nine-letter words, and in a subsequent game situation retain a certain amount of uncertainty whether a word (which one may have previously anagrammed successfully a dozen or more times!) is acceptable or not. It is said that Nigel Richards has a photographic memory. If that were true, he would never need to study (after going through the complete word list once, which he accomplished long ago). He does study, however, but he doesn’t anagram. He reads. Personally, I prefer memorization for many words, but I’m coming around to Nigel’s way, which covers more words per day and which is probably less amenable to forgetting. As for where a beginner should start, there are the usual suspects: two- to five-letter words and common bingos. It is important that anyone who is serious about becoming good go beyond that quickly, however. How much of the year are you in intensive 'word-study mode'? How much of your day/week is devoted to list-learning during this period. I try to study more on an even keel these days. It’s difficult for me to devote great amounts of time to study because life keeps intruding. How does the addition of new words and/or the deletion of old words effect your word study system? The deletion of old words isn’t much of a problem — so far. I study the new words separately, as it is very difficult for me to incorporate them into my memorization system. How much of the North American dictionary do you think you know pretty much cold? What about the World English Dictionary (i.e. Collins)? 96%. 92%, which is too low. Only Joel Sherman, 1997 world champion, declined the invitation (to be replaced by David Eldar). When you were invited to participate in this unprecedented challenge, did you say yes in a heartbeat, or did you have misgivings about it? I said yes in a heartbeat! Can you tell us about your experience at this tournament? No one wants to finish last, as I did. Nevertheless, the tournament was a very positive learning experience for me. Michael Tang is a great tournament organizer, we were treated very well, and I think that it’s fair to say that there was a lot of positive feeling in the room. It was amazing to play one superb player after another for three days. I felt very privileged. When I took up competitive Scrabble in the 1990s, North America dominated the world Scrabble scene. Where do you think they are now, and where do you think they are heading? North American Scrabble is going nowhere. The decision to rate Collins games was a very positive move from NASPA, but outside of that, very little gives me much cause for optimism. We need sponsorships, a proper world championship, and much more support from Hasbro, which got away with murder by getting others to support the visibility of the Game, without paying for it. What Scrabble-related software and websites do you use/visit most often? I play Facebook Scrabble with a small number of opponents, and that number is unlikely to increase. I use Karatasi and SuperMemo for studying, and I play Quackle from time to time. I used to play at the Internet Scrabble Club; enjoyed it, but it became too time consuming. Is there anyone in the game you dread having to play in an important game because your gut feeling is that they'll win? Or is that a trade secret? It would probably surprise most lounge room players to find out how much politics there is in the Scrabble scene, particularly in North America. What's your biggest gripe (or 'wish', if you prefer) relating to the various organizations and agendas behind the North American Scrabble scene? My biggest gripe is that so little progress has been made over the years in turning competitive Scrabble from a diversion to, at least in part, a big-money competition. Neither WGPO nor NASPA seems concerned with this, which is unfortunate. Your longevity in the Scrabble scene is legendary. You haven't just been turning up to the local Scrabble club for 25 years, you've been competing at the very top level for most of those years, and you continue to nab major titles. How would you describe the impact, if any, of age on your Scrabble performance? What advice would you have for someone who discovers an obsessive interest in Scrabble beyond the age of 40, say? When I was in my mid-forties I thought that maybe my game was deteriorating as a result of age. Now I’m not so sure. I have good and bad tournaments, like anyone else, and until I have about ten bad ones in a row, I’ll be unwilling to attribute any decrement in performance to age. Many readers of this interview will be contemplating competitive Scrabble for the first time. What three pieces of advice would you give to these players (while they wait for their copy of How to Play Scrabble Like a Champion to arrive!)? 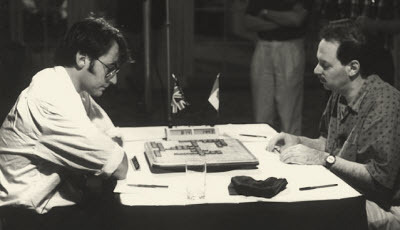 At the 1999 World Scrabble Championship, held in Melbourne, Australia, who should find themselves facing each other in the finals? You guessed it. None other than Joel Wapnick and Mark Nyman were to face off for the great rematch so many had been hoping for. The unfolding symmetry was uncanny. After winning two of the first three games, Joel once again found himself needing to win just one of the last two games. And that game turned out to be an absolute nailbiter. When the dust settled, the scores differed by just a single point! This time, the higher of the two scores belonged to Joel Wapnick. clinched the 1999 WSC title by a single point! That victory is by no means Joel's only major Scrabble title, although it is, by his own admission, the sweetest. Aside from making the WSC finals on an incredible three occasions (2001 was the other one), Joel has won both the US and Canadian National Scrabble Championship. These latter titles are the toughest competitions played to the North American Scrabble dictionary. P.S. When I started writing this interview I was planning to tell you about a great Wapnick move that makes my list of all time favorite plays. But since you're probably a bit tired of reading, I'll save that story for the next Word Buff Stuff! newsletter.